Additional Info: Dale Huggard has served as principal clarinettist in the Saginaw Valley State University concert band, Saginaw Eddy Band, and Midland Community Orchestra. 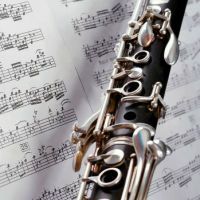 Dale currently performs with the East Shore Wind Symphony, the Saginaw Eddy Band, Midland Community Symphony Orchestra, and the Midland Music Society Orchestra. In 2006, Dale performed in Carnegie Hall in New York City with the National Wind Ensemble as assistant principal clarinet. Dale has performed solo recitals and been a featured soloist throughout Michigan. Dale has also performed in many pit orchestras at Midland Center for the Arts and other community theaters. His principal teachers are Joan Dillard, Linda Hargett and Dr. Kennen White.